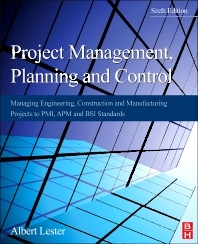 Covering the principles and techniques you need to successfully manage an engineering or technical project from start to finish, Project Management, Planning and Control is an established and widely recommended project management handbook. With clear and detailed coverage of planning, scheduling and control, which can pose particular challenges in engineering environments, this sixth edition includes new chapters on Agile project management and project governance, more real-life examples and updated software information. Ideal for those studying for Project Management Professional (PMP) qualifications, Project Management, Planning and Control is aligned with the latest Project Management Body of Knowledge (PMBOK) for both the Project Management Institute (PMI) and the Association of Project Management (APM), and includes questions and answers to help you test your understanding. It is also updated to match the latest BS 6079 standard for project management in construction. Structured according to the logical sequence of a major project, with a strong focus on planning, scheduling, budgeting, and control—critical elements in the management of engineering projects. Project and contract managers, planning engineers and program managers in the engineering, construction and manufacturing sectors; Those studying for professional project management qualifications through the PMI and APM; Students on project management courses as part of broader undergraduate and graduate programs. Sample BIM Project – Alta Bates Summit Medical Centre - by DPR Construction Inc.
How Does a Generic Agile Development and Project Run? Albert Lester is a Chartered Engineer with a lifetime’s experience of project management in engineering design and construction. He has taught and lectured widely on the topic and is a regular member of panels developing new project management standards and syllabuses. "An excellent book... written with wit and clarity, it should be read eagerly by the managing director as well as the engineering trainee." This book arouses interest to learning through its pages, and maybe the best thing: it makes you questioning about the fundamentals even if you are an experienced Planner/Controller.